Vancouver, British Columbia--(Newsfile Corp. - September 10, 2018) - International Lithium Corp. (the "Company" or "ILC") (TSXV: ILC) announces that it has reached an agreement (the "Raleigh Agreement") to acquire from a third party 55 additional claims adjacent to its Raleigh Lake Project in Ontario. This new acquisition will increase the total size of the Raleigh Lake property to 1,976 hectares, or approximately double the original size. On August 29, 2018, the Company announced that, as part of a wider agreement with Pioneer Resources Limited (ASX: PIO) ("Pioneer"), all the rights, title and interest in the Raleigh Lake property were being returned to the Company, with no further obligations by ILC. Pursuant to the Raleigh Agreement, the Company will pay the vendor a combination of cash and 400,000 ILC common shares to acquire a 100% interest in the new Raleigh Lake claims, with no further encumbrances or royalties. A map of the enlarged Raleigh Lake claim area is shown below, and displays both existing claims (blue) and new claims (green). The property has a convenient location in a relatively unpopulated area, and benefits from a close proximity to the major N17 Trans-Canada Highway. The Company also announces that it has reached an agreement (the "Forgan Agreement") to sell its Forgan Lake mineral rights to Ultra Lithium Inc. (TSXV: ULI) ("Ultra Lithium"). The Forgan Lake property is comprised of one legacy claim, TB4244103 (converted in 18 cell claims and two boundary claims as of April 10, 2018 by the Ontario Ministry of Northern Development and Mines). The consideration to be paid to ILC is a combination of cash and shares totaling an aggregate CAD$200,000, payable over two years. The sale is subject to Ultra Lithium spending CAD$500,000 on development expenditures before September 2020, failing which the property will revert to ILC. In addition, as part of the consideration, ILC will receive a 1.5% Net Smelter Returns Royalty on future production, both from Forgan Lake and from an adjoining property owned by Ultra Lithium. John Wisbey, Chairman & CEO of the Company said, "Raleigh Lake is the property in Ontario that we were most excited about. 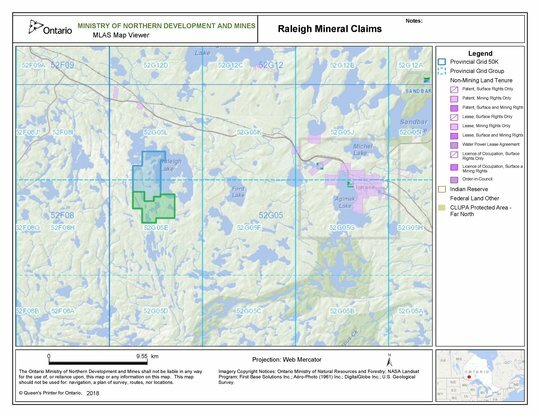 We have not only got back all our rights to this asset, but we have now been able to acquire further rights that almost double the area of our claims in the Raleigh Lake area that we believe maximizes the potential of the mineralization that exists on the claims. I am very pleased that we have been able to move at speed like this to achieve a strategic goal in Canada. We will be conducting some drilling in the next few months with the goal of validating our hopes for the potential of Raleigh Lake. We believe there is considerable potential, although until we have more drilling results to complement those drilling results from earlier years and the magnetic drone survey carried out in 2016, there is always the risk that we may be disappointed. Our property at Forgan Lake was not large enough to be strategic to us, but it complemented Ultra Lithium's existing portfolio in the area, so the disposal was a win-win." Anthony Kovacs, COO of the Company added, "ILC's original claims on Raleigh Lake were drilled for tantalum by a previous operator. This work identified shallow dipping to almost flat lying tantalum, lithium and rubidium mineralization in drill core, later confirmed by a second operator in 2010, covering a surficial area of over 300 metres by 600 metres. Although the lithium content was appreciable, no further work was conducted until after ILC acquired the property in 2016 and a magnetic drone survey was carried out. Our expectation is that this mineralization extends into the newly acquired claims. With this in mind, we will be planning for some exploratory drilling over the next few months, both on our existing claims and on the new claims." The Raleigh Agreement and the Forgan Agreement are subject to approval of the TSX Venture Exchange. Any shares issued will be subject to a hold period of four months from the date of issue. Afzaal Pirzada, P. Geo., a Qualified Person as defined by National Instrument 43-101 and a consultant to the Company, has reviewed and approved the technical content in this news release. The Raleigh Lake project, now consisting of 1,976 hectares of adjoining mineral claims in Ontario, is now regarded by ILC management as ILC's most significant project in Canada. It is 100% owned by ILC, is not subject to any encumbrances, and is royalty free. The Forgan Lake project will, upon Ultra Lithium meeting its contractual requirements pursuant to its agreement with ILC, become 100% owned by Ultra Lithium (TSXV: ULI), and ILC will retain a 1.5% NSR on Forgan Lake. Except for statements of historical fact, this news release contains certain "forward-looking information" within the meaning of applicable securities law. Forward-looking information or forward-looking statements in this or other news releases may include: the timing and/or anticipated results of drilling on the Raleigh Lake or Mavis Lake projects, the expectation of feasibility studies, lithium recoveries, modeling of capital and operating costs, results of studies utilizing membrane technology at the Mariana Project, budgeted expenditures and planned exploration work on the Avalonia JV, satisfactory completion of the sale of mineral rights at Forgan Lake, satisfactory completion of the purchase of additional mineral rights at Raleigh Lake, and continued agreement between the Company and Jiangxi Ganfeng Lithium Co. Ltd. regarding the Company's percentage interest in the Mariana project. Such forward-looking information is based on a number of assumptions and subject to a variety of risks and uncertainties, including but not limited to those discussed in the sections entitled "Risks" and "Forward-Looking Statements" in the interim and annual Management's Discussion and Analysis which are available at www.sedar.com. While management believes that the assumptions made are reasonable, there can be no assurance that forward-looking statements will prove to be accurate. Should one or more of the risks, uncertainties or other factors materialize, or should underlying assumptions prove incorrect, actual results may vary materially from those described in forward-looking information. Forward-looking information herein, and all subsequent written and oral forward-looking information are based on expectations, estimates and opinions of management on the dates they are made that, while considered reasonable by the Company as of the time of such statements, are subject to significant business, economic and competitive uncertainties and contingencies. These estimates and assumptions may prove to be incorrect and are expressly qualified in their entirety by this cautionary statement. Except as required by law, the Company assumes no obligation to update forward-looking information should circumstances or management's estimates or opinions change.